There's something about magicians and the four aces in a deck of cards in a close-up effect or routine. Perhaps it's a demonstration of sleight of hand skill or card-cheat/gambling prowess that a magician can shuffle a deck and somehow deal the four aces at seeming will. After all, if a magician can mix a deck and somehow deal the four aces, wouldn't this be potentially useful in a game of poker? In another variation of the trick, the spectator shuffles the cards and then the magician or the spectator is able to somehow cut to the four aces. Again, it can be a demonstration of apparent sleight of hand or gambling skills, or it may have no explanation in the mind of the spectator. It's pure magic. All you need to perform the tricks here is an ordinary deck of cards that has four aces. While it may look like it, none of the tricks here require any sleight of hand or complicated moves that take years to learn and master. All are simple tricks that you can quickly master once you've studied our step-by-step instructions, learned the secret and practiced the tricks. Of course, there's no reason why you have to use the four aces. If you like, you can use the court cards: king, queen, or jack, or any four of a kind that you wish. Using other four-of-a-kinds allow you to create themes with any numbers that you wish. For example, you can tell spectators that your favorite number is "seven" and then after a cutting and mixing process, either deal or cut to the four sevens in a deck of cards. 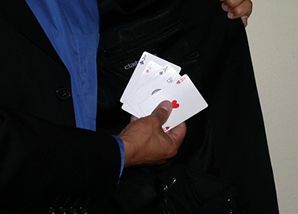 These tricks are also part of a poker themed act. You can show spectators that you can easily cut to or deal any four of a kind after a mixing process. You'll find that these routines can play surprisingly strong. You can open your act by bringing out a deck of cards and then producing the four aces (or your choice of any four of a kind). You can also close your act with a similar demonstration. These are beginner's tricks that allow you to quickly learn to work with four aces. And you should do quite nicely with them. But there are advanced tricks with the very same theme that experienced amateur and professional magicians perform that can take lots of practice. How to Cut to the Aces. Here's a way to look like a slick gambler. It’s a great easy card magic trick where you deal yourself four aces in a hand of poker. Your friends won’t want to play cards with you.